Al Ahly have won the first 13 matches in the Egyptian league to rewrite the history books. The feat by Al Ahly is the first time that a club has won all their matches in the first half of a season since the league began in 1948. The Cairo club claimed the record with a hard fought 2-1 win over Ghazl El Mehalla on Thursday. The victory was sealed when top marksman Emad Metaab scored from the penalty spot. Ironically, two weeks earlier Ghazl El Mehalla had knocked Al Ahly out of the Egyptian Cup in a penalty shoot-out. "This was our toughest game this season so far but we deserved the victory," Al Ahly coach Manuel Jose said. "Setting the record is not the end of the road. "We have already lost a title and our opponents will be more eager to defeat us. "We're on top, but the challenge is to stay there." Al Ahly's winning streak means they are already 12 points clear at the top of the league ahead of their arch rivals Zamalek, whose 52-match unbeaten run was ended by Al Ahly in November. 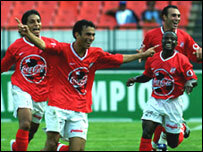 Nicknamed 'The Red Devils', Al Ahly were named the African Club of the Century by the Confederation of African Football in 2000.